French onion has everything that you want in a food experience. It comes to the table with a heat warning and smoke wafting from the crunchy, highly toasted cheese clinging to the broiled crockery. Good French onion soup is a uniquely crafted bowl to be explored, not just slurped. You spoon down through layers of molten cheese and crusty bread into the soft onion slivers in a serious bone broth. Since the word “French” is part of the name, it sounds like you need a chef but French onion soup isn’t hard to make. You just need someone willing to slice a lot of onions and cook them properly. The ingredients — onions, water, broth, cheese — are nutritious and inexpensive, so you’re really paying through the nose when you order it at a restaurant. Julia Child did her best to demystify this comfort classic — check out the French onion soup episode of The French Chef on Youtube. In her Mastering the Art of French Cooking cookbook, she even recommends serving it during football games, such as the one being played this Sunday. It’s a big upgrade on French onion dip. 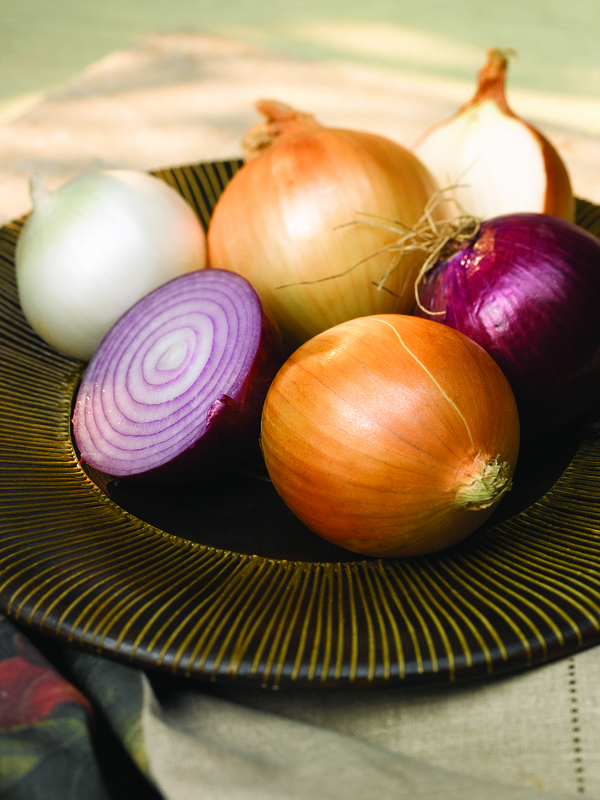 Various chefs have various rules about which onions work best in a soup. I ignore them. I like to mix members of the onion family using various yellow, white and red onions along with shallots, garlic and leeks. I think it adds more depth and boosts that great aroma. It takes a tremendous pile of slivered raw onions to make this soup. You almost cannot have too many, so you can end up weeping uncontrollably. While you may need a good sob, you might avoid the irritating effect of syn-propanethial-S-oxide. Refrigerate the onions for a few hours after peeling them. Before you start slicing, open a window and turn on a fan and wear swim goggles. You will need your largest pan to cook down all the onions in one batch, low and slow. Caramelize, don’t scorch. In the beginning, there must be broth. A great bone broth is essential and you can use canned broth — I have — but once you make it you’ll never go back. Just roast some soup bones, beef or pork, in the oven before simmering them with vegetables, herbs and seasonings. Roast chicken bones work too. Make it vegetarian with a robust veggie broth or miso. A crouton can be any old bread, but the best are made from dense loaves sliced very thickly. On her essential recipe for Soupe à l’Oignon Gratinée, Julia Child recommends “a chewy homemade type of bread.” It shouldn’t be fresh. Dry it out before you toast it. For a change of pace try cinnamon raisin. Dark caraway rye works well and the soup can become positively Reuben-esque with the addition of chopped pastrami. Be sure to heavily brush the toasted croutons with melted butter and olive oil. 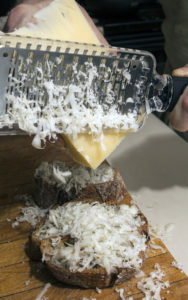 For extra oomph, rub the toast surface with cut raw garlic cloves before toasting. Traditionally, French onion soup is made with a grated, firm, nutty cheese like Gruyere, which melts but doesn’t dissolve. Other good choices are Swiss, Emmentaler, Manchego, Raclette and Parmesan. I use what I have. 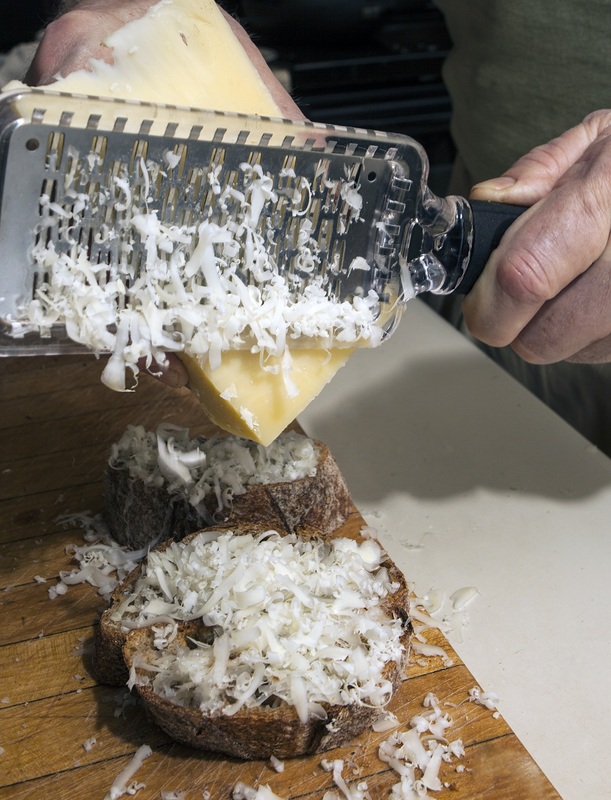 Skip Mozzarella and Provolone because they tend to rubberize. Cheddar tends to make sauce, which might not be a bad thing. This is a great dish to learn because after you make it you can ignore this recipe. Melt butter with olive oil over low heat, add onions and salt. Every few minutes turn the slowly diminishing pile on itself. Let onions cook for about 20 minutes until translucent and soft. Raise the heat to low medium and cook for another 20 minutes or so, stirring until onions turn golden brown. Stir flour in, add several cups of broth and stir until flour is dissolved. Add remaining broth plus wine, bay leaf and thyme and simmer on low for about 45 minutes. Season to taste with salt and pepper. Add Sherry, if desired. Brush thick bread slices (1 1/2 to 2 inches) with butter or olive oil on both sides. Toast, flipping once, until deeply browned. Make sure soup is steaming hot. Ladle into oven-proof bowls or casseroles, top with bread and liberally pile each with shredded cheese. Make sure bowl is dense with onions, broth and bread to support the cheese crown. Place the bowl under a broiler until the top is suitably scorched and molten. You can also place it in a hot oven for 10 minutes. Remove and serve immediately with bread. Makes four to six servings. Variations: Add a poached egg when serving. Turley’s Kitchen, an eatery which traces its roots back to Boulder’s mid-’70s heyday, is for sale. The restaurant started out as the Good Earth Restaurant on Pearl Street in 1977. It became The Harvest Restaurant and then Turley’s and was famous for the smell of the spiced orange tea and cinnamon rolls. It was the first sit-down, natural foods-oriented eatery to survive, owing to the singular devotion of the Turley family. I’ve always loved the turkey cashew salad sandwich. … The millennial-focused Capitol One Cafe has opened at 1247 Pearl St. in the former Boulder Café (and bank) space. The menu features free WiFi, meeting areas, espresso, baked goods, sandwiches and some banking services offered by “café ambassadors.” … Coming soon: Denver’s topnotch Stem Cider is building a restaurant, taproom, production facility and apple orchard on a four-acre plot in Lafayette. Last year Stem brewed 7,500 barrels of cider. When the Lafayette facility opens, it can make 100,000 barrels annually. … Improve the remainder of your life (dessert-wise, at least) by taking a class in making pie (and the even-easier galette). Feb. 5 and 12, through Lifelong Learning. Register: bvsd.org/LLL. Virtually every Indian eatery has chicken tikka masala, cheese naan and palak (or saag) paneer on the menu, but few prepare them as well as Azitra, the recent addition in a comfy, modern space at 535 Zang St. in Broomfield. The tikka has chicken chunks in a great creamy tomato sauce. There is nothing like scooping up chunks of cheese in smooth, spiced spinach with a warm, soft cheesy naan. Azitra also boasts some hard-to-find regional dishes and modern takes on classic Indian preparations. John Lehndorff is the former Dining Critic of the Rocky Mountain News. He hosts Radio Nibbles at 8:25 a.m. Thursdays on KGNU, 88.5 FM, 1390 AM, kgnu.org. Tags: football, Julia Child, onion soup, Onions, Super Bowl, Turley's Kitchen. Bookmark the permalink.